Well of course there are! The beauty of foosball is that many of the rules are handed down by word-of-mouth, and you probably know most of them already – but now we’re putting them all down in one place. How many of these did you know already? 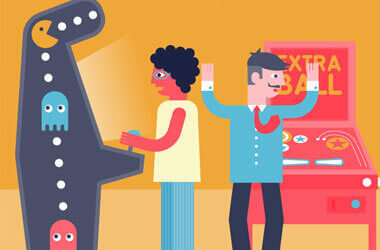 Many casual players simply chuck the ball into the middle of the playfield, but that’s not the way it’s done – instead, the winner of a coin toss first decides whether they want to kick-off or choose a team. Whoever gets the kick-off receives the ball in the centre of their midfield 5-bar. For the rest of the game, kick-offs go to whichever team conceded the last goal. Before kick-off, the serving team must check that their opponent is ready, and – this is the interesting part – the ball must be passed between two players on the 5-bar before being pushed forward. Remember that you can’t score a goal straight from kick-off – if you do it’s considered invalid and the ball is restarted. If the ball is thrown off the table, the play is restarted by whoever kicked-off in that last turn. If the ball can’t be reached by any player (known as a “dead ball”) then play is restarted as above. One exception is if the dead ball is behind the 2-bar, in which case the restart goes to that 2-bar. Don’t just blow on the ball until it’s back in play! This is our favourite, but it’s a bit complicated: If a restarted ball goes dead at kick-off, the restart is forfeited to the other team. So don’t mess it up! A-ha! 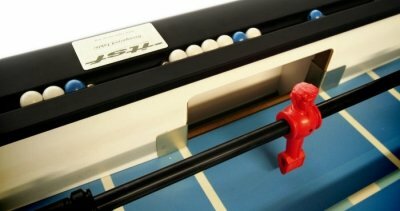 Bet you didn’t know there were time limits in table football, eh? Well there are, to stop people faffing about with the ball or lining up unreasonable trick shots. Time limits begin as soon as the player touches the ball, and penalty for exceeding it is a midfield restart to the other team. The goalie is also included in the 2-bar, so try not to keep the ball down that end for too long. During open play, goals can be scored by any player at any time – the only exception is the 5-bar straight after kick-off, before the ball has touched another player. One sneaky rule we didn’t know: If the ball bounces into goal and back out of it again, it still counts, and the ball is restarted at kick-off from the conceding team as usual. 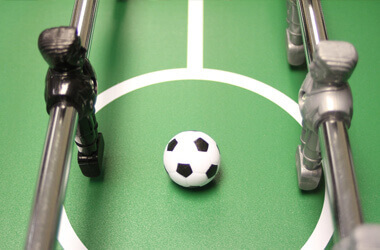 Foosball is a sociable game, and as such there are certain rules about how players can behave during a match. Each team is allowed two time-outs of up to 30 seconds each, so if you need to talk strategy (or grab a pint) this is the best time to do it. Time-out can only be called by the team in possession of the ball, and only if the ball is stationary – or, alternatively, when the ball is out of play. If you’re playing doubles, players are allowed to change sides, either during a time-out or between balls. Sometimes it helps to put a fresh spin on things (sorry). Most of these are fairly well-known already, but it’s always worth going over them again – especially if you’re playing with people who like to contest the pushing the table around is definitely a valid move (it isn’t) or that spinning the bar just once is totally acceptable (it is!). Jarring the table: No shifting the table around at all, even in the case of a dead ball. Distraction: No shouting, no smoking, no pointing over people’s shoulders and saying “what’s that?”. Play fair. Spinning: If the rod rotates by more than 360 degrees before or after hitting the ball, it’s a foul. A single spin (known as a “snake shot”) is all that’s allowed. Interference: Do not reach into the playing area unless agreed upon by both teams. If your team has the ball, it goes to an immediate restart with midfield kick-off to the opposing team – if your opponent had the ball when you reach in, they gain an immediate goal! The opposition can choose the penalty from either: midfield restart; play from place of infraction; or play from current position. Five goals is the winning condition, but you must win by 2, up to a maximum of 8 points. If there is controversy over whether or not the ball entered the goal, an official should be called to settle the dispute. The official may make their ruling based on information given by the players and spectators. Borrow a friend or partner for this one. At the end of each doubles game, players can switch places with each other. If both teams choose to do this, they must continue to do so at the end of each game from then on. Any player who removes their hands from the rods while the ball is in play (to wipe hands, grab a drink, etc) will be penalised for distraction. Dress code (no, really! ): Acceptable clothing for players include warm-up jackets and trousers, athletic sportswear, athletic shorts and sports shoes. Caps, visors and sweatbands are also acceptable. Players may not wear jeans, slogan t-shirts, sandals or form-fitting Spandex. Of course, on top of these there are also house rules, pub rules and folk rules, so don’t forget to clarify what’s allowed before you get started on a table – and if you’re thinking of buying your own, get these printed up alongside it so you always know when to call your opponents out for those extra kick-offs!